When Australians remember 1918, the climactic year of World War I, they give a prominent place to the Battle of Le Hamel on 4 July 1918. Often celebrated as the perfect battle, Hamel gave the newly appointed commander of the Australian Corps, General John Monash, the chance to display his consummate skills as a planner and military leader on the Western Front. Beyond that, Hamel had the distinction of being the first, and effective, collaboration between the Australian Imperial Force and the American Expeditionary Force. 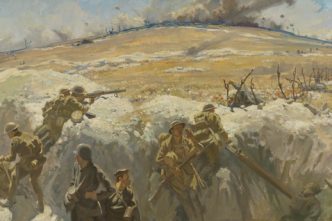 Less well known is the next occasion on which the two national forces served under Monash’s command, the Battle of the Hindenburg Line in late September 1918. This was a far more significant battle strategically than Hamel, and one that went much less according to Monash’s plans. Indeed, as one of Monash’s biographers, Geoffrey Serle, has said, the battle came ‘close to being a disaster’ (p. 363). And relations between the Australian and US commanders were much less harmonious. By September 1918, the Allied armies had managed to stop the dramatic German offensives of the spring and summer of 1918—offensives that had broken the stalemate on the Western Front and for a short time seemed to give Germany a chance of winning the war. The Allied powers were now in a position to recapture the territory that Germany had seized in the first offensives of the war in 1914. The Allied command launched three major offensives in late September. In the south, American and French forces attacked between Rheims and Verdun along the Meuse and through the Argonne Forest. It was a battle that continued until the armistice of 11 November and ultimately captured Sedan, the place where the French had suffered a humiliating defeat in the Franco-Prussian War of 1870–71. In the north, on 28 September, a multinational force of Belgians, French and British launched the final of five battles around Ypres, recapturing Mount Kemmel, Messines and Passchendaele Ridge and driving towards Ghent. 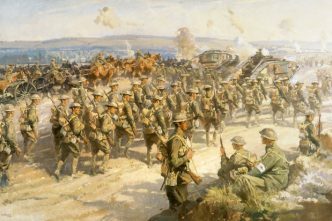 In the centre, the British Fourth Army, including the Australian Corps, attacked the most powerful section of the Hindenburg Line between Cambrai and St Quentin on 29 September. 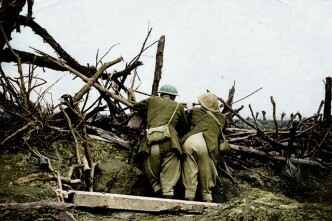 The Hindenburg Line was a formidable defensive line to which the Germans had retreated across the Western Front in early 1917 after the bitterly contested battles of Verdun and the Somme had failed to end the war in 1916. Facing the Australian Corps in late 1918 was the usual jungle of barbed wire, pillboxes, trenches and underground bunkers; but incorporated into that was another daunting obstacle, the St Quentin Canal. It was 30 metres wide and 15 metres deep, had a water depth of 2 to 3 metres and sides too steep for tanks to negotiate. Although the canal went underground for 5,500 metres south of the village of Bellicourt, that only gave the German defenders a natural bunker. There they could shelter from the Allied bombardment, wait for an attack to pass over them and then emerge from airshafts and concealed passages to counterattack the advancing forces from the rear. The surface ‘bridge’ above the tunnel was itself heavily fortified with multiple lines of defences, including anti-tank guns. To break through the forbidding line of defences, Monash was given command of a vast multinational force: in the centre were three Australian infantry divisions (the 2nd, 3rd and 5th); on the right, the British 46th Division; and on the left, two fresh American divisions, the 27th and 30th, from the II Corps. These large US divisions had been offered to replace the 1st and 4th divisions of the Australian Corps, which were resting after an exhausting few months of battle. Although it was the preference of the commander of the American Expeditionary Force, General John Pershing, that his forces fight as a national unit, the two US divisions stayed with the British Army throughout the war. 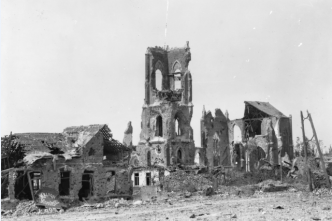 The plan to break the Hindenburg Line was complex, and, in some ways, risky, given the inexperience of the Americans who were to attack across the canal–tunnel surface, capturing the villages of Nauroy and La Catelet. The Australian 5th and 3rd divisions would follow, leapfrogging the Americans and taking the final (Beaurevoir) line of the German defences 4 kilometres further on. At the same time, the British IX Corps would cross the open canal to the south, using collapsible boats, life jackets, ladders and even floating bridges. (The crossing of the canal was added to the plans by the commander of the Fourth Army, General Henry Rawlinson, against Monash’s advice.) If all this succeeded, the advance would be exploited with cavalry, a force still awaiting that glorious moment when they would break out and unravel the enemy lines. Monash would later call commanding these operations one of the most arduous, difficult and responsible tasks he undertook during the war. In a remarkable demonstration of good sense and self-effacement, the US commander of the II Corps, General George Windle Read, agreed to place his inexperienced troops and staff under Monash’s direct control. That involved Read’s swallowing his pride and probably abandoning hope of favour and preferment in his own army. 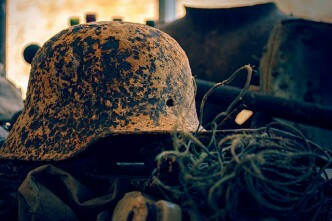 As the eminent American military historian Dennis Showalter has written, he accepted ‘“makee-learn” status for the good of the service and the sake of the men he commanded’ (p. 464). Monash stressed to all present at the meeting the importance of teamwork, of adhering strictly to prescribed objectives, of disseminating orders to junior officers and of making appropriate provision for the troops, including adequate food and sufficient sleep. In particular—and this would become an issue during the subsequent battle—he emphasised the need to mop up pockets of German resistance before moving forward. Accounts of how Monash’s briefing was received vary. The US Commander of the 27th Division, General J.F. O’Ryan, recalled that there were ‘not more than five or six questions asked in all by the American officers present … General Monash’s conversation and explanations were so lengthy and detailed that there did not seem to be necessity to ask many questions’ (p. 256). Serle, however, notes that another account described such a rain of questions that Monash spent three hours with blackboard and chalk, maps and diagrams attempting to explain the logic and risks of the forthcoming operation (p. 364). For all of Monash’s meticulous planning, operations started to go awry even before the main offensive started. The problem was that, in the lead-up to the battle, the British III Corps had failed to straighten the line held by Allied forces to the north. That left the US 27th Division short of its assigned start line for the main attack on 29 September. Rawlinson therefore decided that the Americans should capture some critical points—the Knoll, Gillemont Farm and Quennemont Farm—even before the main assault began. Going into action on 27 September, the Americans met heavy opposition and became disoriented by the fog and smoke of the intense artillery fire, which made visibility non-existent. Soon they splintered into small groups and were pushed back as Germans emerged from hiding places to counterattack. Their casualties were huge: in one battalion, every company officer was killed or wounded. Even more problematically, some American troops became stranded in the very area where the barrage for the main attack two days later would fall. Their precise location was unknown and, as O’Ryan argued, it would have been ’repulsive to the mass of the officers and men’ if the barrage had been laid down as planned, given that this risked killing the stranded men (p. 300). The barrage for the main attack therefore had to be targeted a thousand metres ahead of where the 27th Division would actually start their attack. It had been proven, time and again, on the Western Front that infantry could succeed only when supported by a strong and accurate creeping barrage; so this put the Americans at a huge disadvantage on 29 September. It was a decision that reduced Monash to a ‘state of despair’ (Serle, p. 365). Ahead of the Australian 5th Division things were a little less chaotic, since the US 30th Division, which did have the support of a creeping barrage, captured one entrance of the tunnel. But as they pushed on, the 5th Division got ahead of the 3rd Division and met German reinforcements streaming down from positions that the US 27th Division was meant to have captured. Only in the south was real success achieved. Helped by the fog and extraordinarily accurate artillery barrage which demolished German defences—the banks of the St Quentin Canal were so shattered that some troops could cross without getting their feet wet—the British 46th Division crossed the canal and captured the Riqueval bridge intact. By mid-afternoon the Hindenburg Line in that sector had been breached. With progress stalling in the centre and north, however, Monash found that his carefully prepared plans were unravelling. He directed the Australian divisions to swing to the north along the main Hindenburg Line system with the goal of capturing Bony and the northern end of the tunnel. This redeployment during the night of 29–30 September was horrific. Infantry, tanks and ammunition supply columns struggled in the heavy rain to get across land full of old wire. The battle descended into a ‘slow and methodical hand to hand fighting, in a perfect tangle of trenches’, as Monash put it (Serle, p. 366). [Monash] was very insistent on the fact that he doubted whether the Americans would succeed in carrying out their objectives … It struck all of us [war correspondents] that John was hedging against a possible defeat, in which case he would be able to throw the blame onto the Americans. Monash would soon become openly scathing about the Americans, claiming that they rushed on blindly towards their objectives, while disregarding his warning about the importance of careful mopping up of pockets of resistance. Bean records that Monash told him on 30 September that the Americans had ‘sold us a pup … They’re simply unspeakable’. It was not Monash’s finest hour. He not only blamed the Americans but argued with the commander of the Australian 3rd Division, General John Gellibrand, who had different views about how to read the battle and react to the unfolding situation. Gellibrand, writes Sadler, believed that Monash struggled to ‘face defeat with determined coolness of mind and conduct’ (p. 181). Certainly, Monash’s chief of staff, Thomas Blamey, lost his cool. Serle notes that not only did he refuse to accept Gellibrand’s assessment of the situation, but he abused an American divisional commander, swearing at him ‘like a bullock driver’ (p. 366). Blamey was the man who would have responsibility more than 20 years later, when commander-in-chief of the Australian Military Forces, for managing the alliance with the United States that ensured Australia’s security from Japanese attack. Monash’s diatribe against the ‘unspeakable’ Americans was unfair. Whatever the failures of the US infantry and their communications systems on 27 September, the distance that the troops had to cover during the battle was almost certainly too great. The breadth of their attack also made the leading waves very thin. Monash seems to have known that and asked Rawlinson for a day’s delay in the main battle to rectify the situation caused by the failure of the initial American attack (Rawlinson refused). Pershing, therefore, argued after the war that the problem was not the inexperience of the 27th Division but the distance it had to cover. Showalter, too, argued that Monash ‘was expecting a longer advance from the Americans than he had ever demanded of his Australians, and against fixed defences’ (p. 466). Monash, he claimed, relied on artillery and tanks to compensate for the Americans’ inexperience, even though firepower had never proven enough in earlier battles of the war to do that. Moreover, the deployments of Monash’s plan of attack, Showalter argued, meant that the 27th and 30th divisions were handed ‘the sharp and sticky end of the job’. Fortunately, the situation on the battleground improved as German resistance began to ebb. 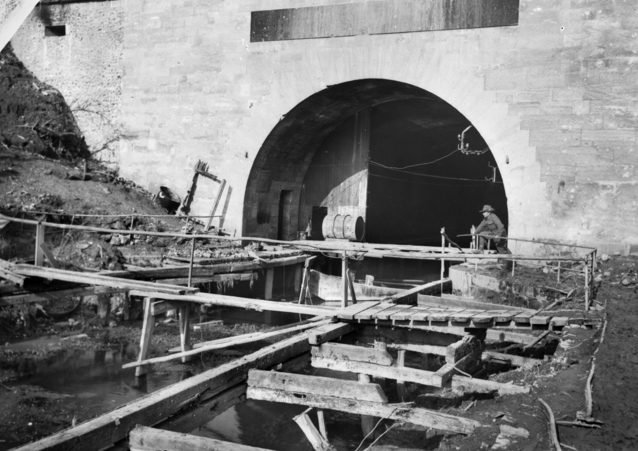 The Americans were taken out of the line on 1 October and the British 32nd Division, which had crossed the canal, began to outflank the Germans, forcing them to evacuate the tunnel. Bony fell and the 3rd and 5th divisions pushed their way through towards the Beaurevoir line. 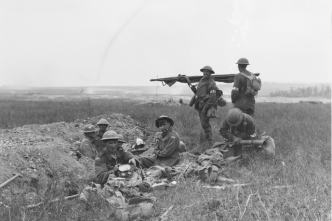 The 2nd Division relieved them and, although undermanned and weakened by gas attacks, made a frontal attack at dawn and took the Beaurevoir line. Given the tensions that the battle created, it was not an exemplar of harmonious Australian–US military collaboration. But the frustrations seem to have had no lasting effect, at least in that conflict. The Australian and US troops would not fight together again on the Western Front. On 5 October the Australians Corps, exhausted and very much understrength, was removed from the line, and would not return before the armistice. The US II Corps, despite their failure of 27 and 29 September, relieved the Australians a week after the battle, and fought on until 20 October, during which time they suffered over 13,000 casualties. The 30th Division ultimately was awarded 12 Congressional Medals of Honor, more than any other American division. The US commanders were equally diplomatic. In a report of 18 December 1918, Read was willing to concede, as Monash claimed, that his corps had tactical shortcomings, which he ascribed in part to training in open warfare that emphasised headlong advances but neglected liaison and mopping up operations. But Read also commended the British Fourth Army for its policy of supplying the II Corps ‘with every possible assistance and [protecting] American lives every whit as carefully as the lives of British troops’ (Showalter, p. 468). Meanwhile, O’Ryan’s history of the 27th Division published in 1921 acknowledged the many difficult questions that the management of the campaign had raised but offered no criticisms of Monash. Rather, O’Ryan concluded that ‘the decisions made by the 4th Army Commander [Rawlinson] and by the Commander of the Australian Corps in relation to the conduct of the battle were fully justified by the results of the battle’ (p. 339). Moreover, he inserted into this chapter a peon of praise to the Australian soldier and the staff of the Australian Corps. This was a generous ally indeed! Joan Beaumont is professor emerita at the Strategic and Defence Studies Centre, Coral Bell School of Asia Pacific Affairs, Australian National University. 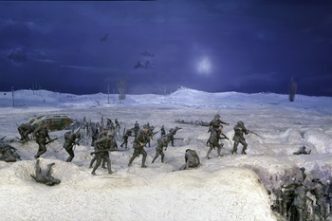 Image courtesy of the Australian War Memorial.